Today the 64 surviving players of the original 289 entrants returned to play down to the final table. Among them were Day 1 chip leader Jorge Solorzano; WSOP Circuit National Championship point leader Shiva Dudani; WSOP bracelet winner Robert Cheung; and gold-championship ring winners Drazen Ilich, Tuan Bui Le and Kyle Knecht. Although some of these players managed to make the money, only Solorzano could ride his success all the way to the final table. On an interesting Circuit note, Dudani’s 17th place finish added 20 points to his WSOP-C National Leaderboard total, bringing it to 145. With his closest competition sitting with only 90 points, Dudani may have punched his ticket to the National Championship in May. Likewise, Dudani and Tuan Bui Le’s eliminations ensure that Kevin Manley will finish as the biggest point earner at the Southern Indiana Circuit for which he will earn a spot in the Championship. The final table is set to commence at 1:00 p.m. local time. Who will take down the $99,878 first-place prize and a spot in the National Championship at the end of the season? Be sure to check back here for all the updates as PokerNews brings you all the action and eliminations from the WSOP-C Southern Indiana. Mike Foster was on the button and raised to 50,000. 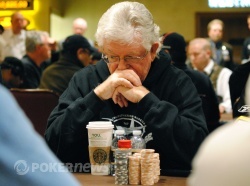 Kenny "Bad Hat" Piel was in the small blind and moved all in for around another 100,000. Perhaps he was looking to be the fox in the henhouse and steal the goods, but Foster had other ideas and made the call. The board ran out and Piel was knocked out of the tournament in 10th place. With his elimination the official final table has been reached and action is done for the night. Straight off the table to your viewing screen. Players are now on a ten minute break. Jorge Solorzano raised to 55,000 and then from the big blind, John Alfera reraised to 115,000. Solorzano didn't think twice and quickly called. The flop came down and Alfera moved all in for 429,000. Solorzano tanked and tanked. Eventually, he removed the chip from protecting his holecards and slid them forward for the fold. Alfera scooped the pot. 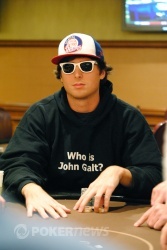 Garrett Utt raised from the button all in for 113,000. 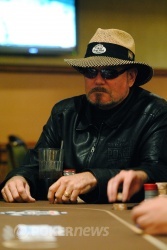 Brian McKain made the call from the big blind claiming that he felt Utt would be doing that with any two cards. Utt held the and McKain the . The flop came down and Utt said, "Not the flop I had in mind." The turn card brought the and Utt pointed two fingers towards his head and pulled the trigger with his thumb, signaling, "Just shoot me." The river then completed the board with the and Utt was sent to the rail in 11th place. He earned $7,420 for his finish. The remaining 10 players are now redrawing to one table for the unofficial final table. 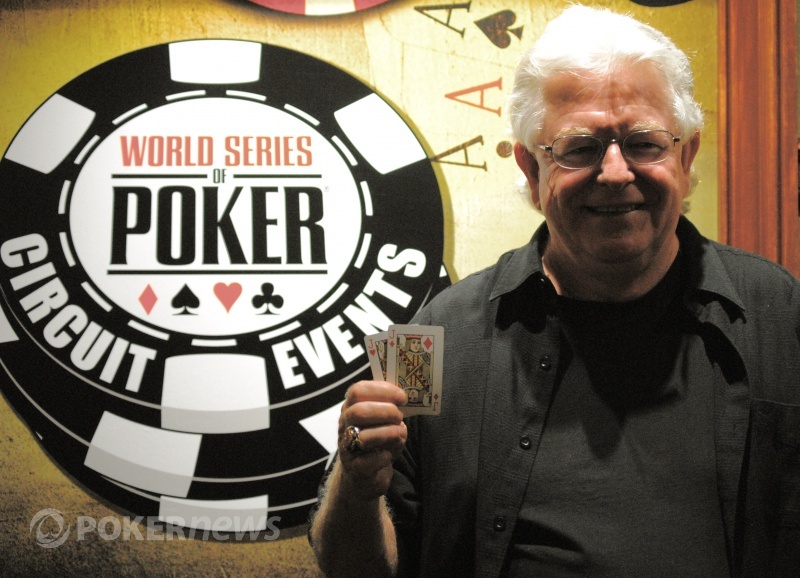 All five players saw a flop of and three of the players checked over to Charles "Woody" Moore, who bet 22,000. Joel Merwick, who was sitting directly to Moore's right, made the call and then checked the on the turn. Moore followed suit as the appeared on the river. This is where things got interesting. Merwick put out a reasonable bet of 60,000 only to have Moore immediately announce that he was all in. Merwick, who had over 500,000 behind, was put to the test for his tournament life. "Wow," he said as he looked at Moore. Merwick tanked for a solid three minutes before saying, "I have such a big hand right here. I've got a monster. I flopped a flush." After another couple of minutes Merwick called the clock on himself, which more often than not signals a fold. Sure enough, Merwick tossed his cards in the muck about halfway through the countdown. 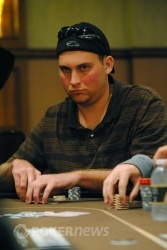 Moore revealed the as he slid his cards to the dealer and scooped the pot. Action folded to David Clough in the cutoff and he moved all in for around 110,000. Joel Merwick was in the big blind and quickly called. Clough was racing for his tournament life as the flop came down . The on the turn left Clough shaking his head as if he was resigned to defeat. The on the river provided no relief and Clough was eliminated from the tournament in 12th place.